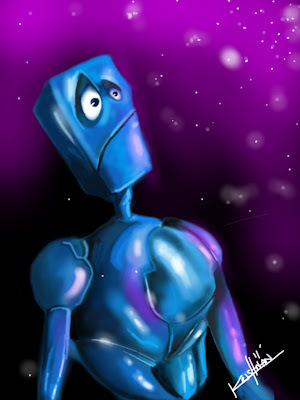 Much of the iPad art that I have done comes by way of a great app/program called Sketchbook Pro. The load screen includes this really elegant red robot in the rain, and that somehow triggered this image in my mind. As I write this though, I am reminded of this 2005 movie Robots and this image possibly shares some similarity with the main character of the film (ok... mainly in color). A lot of human-computer interaction comes by way of how much of the computer/robot's "face" can be used to convey emotive information, and I like the idea that this robot has a spartan set of features but manages to convey something in its expression.